You can use construction paper to make your own paper flower craft. There are a ton of different ways to design and make your own flowers out of construction paper. Here are a few ideas that I think you will love to get you started! Construction Paper Flower Picture. For these easy construction paper flowers you can reuse scrap paper to make construction paper flowers. 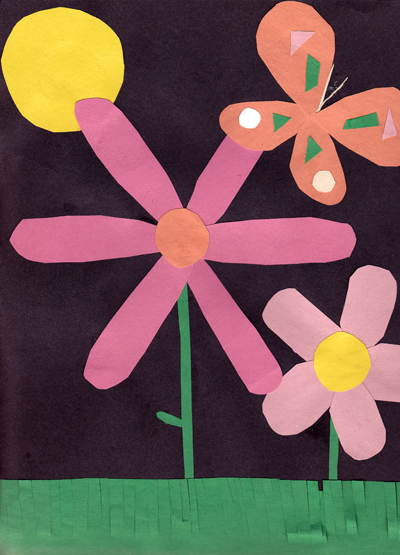 Making construction paper flowers is fun and easy for all ages! around the small circle to make pedals. Round off the edges of the paper pieces to look more like flower pedals and glue to the background. To make tulips – cut half ovals and circles and place the flat side up. Add a stem and some leaves using green construction paper. For other flowers – any shape or combination of shapes will resemble a flower when you simply add a stem using a long green strip of construction paper. To make a leaf – glue a short little green piece of construction paper to the stem. To make a butterfly use 2 larger pieces for the top wings and two smaller pieces for the bottom half. Then glue small colored pieces of paper symmetrically onto the wings. Cut a circle out of yellow or orange construction paper to make a sun. For the grass – Cut a strip of green construction paper and snip it along the edges. Folded Paper Flowers Craft. Follow the step-by-step instructions for making your own folded paper flowers. I also love the way they glued these flowers together make a beautiful garland and it would make a beautiful decoration for the classroom wall. Check out this folded paper activity on FirstPallet.com.